I hope last week’s long and comprehensive Weekly Update wasn't too much to digest. A lot has been going on and we wanted to bring everyone up to speed. 2013 Christmas Surprise Packages are over! You love getting them. We love making them available to you. But man oh man, they are a lot of work. So glad Surprise Package season is over. We hope everyone enjoyed their Surprise Packages. I’ll include a small selection of the last of the holiday fan comments elsewhere in this Update for your enjoyment. With the holiday season and Grab Bags behind us, our focus has shifted to getting new product into your hands. Much of our time the past week has been divided between The Rifter® #65, Robotech® RPG Tactics™, 2014 Gen Con Indy, plotting schedules and books, assigning work, business matters, telephone conferences, and dealing with the last of the 2013 Christmas Surprise Packages. Things have been so nuts that I came in to work at 4:30 AM on Tuesday and worked till 7:00 PM. Whew. Heck, we have all been burning the midnight oil on many fronts and worked through last weekend and will be working through this one as well. I may have pushed a little too hard. I started to feel under the weather Thursday evening, and woke up Friday morning with a monstrous head cold. The worst I’ve had in years. Coughing and sneezing. My sinuses will not stop running – my nose is like a dripping faucet (I’ve gone through almost an entire box of Puff’s facial tissue in the last 24 hours!) – I feel drained and I’m told I may have a low fever. In short, feeling pretty lousy. Will try to knock off and go home around 6:00 PM today. In the meanwhile, I’m hiding out in my office, avoiding the rest of the crew as best I can, but I’m still working away to get his Weekly Update posted and take care of a few other things. 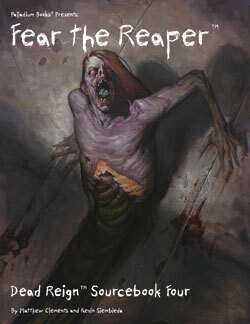 Fear the Reaper™ continues to meet with positive responses. I can hardly wait to see what Matthew Clements comes up with next in the Dead Reign™ Sourcebook: Graveyard Earth. E.M. Gist will do the new cover for it. The Dead Reign™ RPG captures the zombie experience like no other RPG. Check it out. The art is in, the editing done, and Wayne will be doing typesetting and layout over the weekend. Should ship around January 27, 2014. See the full description later in this Update. Another outstanding issue. Rifter® Writers, Artists and G.M.s: More than half of Palladium’s regular writers and many artists started by getting work printed in The Rifter®. Quality fan and semi-professional work is always wanted. This is your chance to be published. 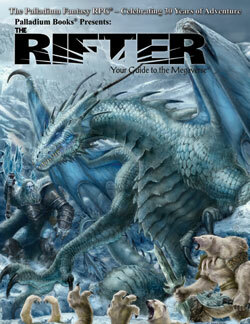 The Rifter® is, after all, a sort of fanzine with official and unofficial source material. 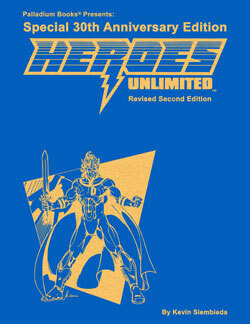 Articles on gaming tips, Game Mastering, adventures and source material (new adventures, characters, villains, monsters, powers, magic, gear, and setting info) for Heroes Unlimited™, Palladium Fantasy®, Beyond the Supernatural™, Nightbane®, Splicers®, Ninjas and Superspies, After the Bomb®, Chaos Earth® and Rifts® are always in demand. Gaming material is most sought after. Short stories are less desirable and should be kept ‘short’ – 4-10 pages, but we often publish a short story in most issues. Come on, write something and send it in. 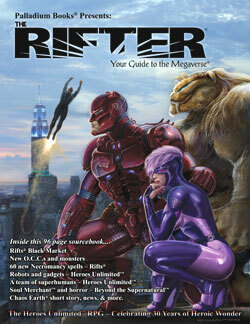 The Rifter® Super-Subscription Drive starts next week. More in the next Weekly Update. Watch for it. I had a great concept and art meeting with Chuck Walton on Wednesday. This is going to be an outstanding book. In fact, Chuck proclaimed that he thought Rifts® Northern Gun™ Two might be even better than Northern Gun One with its diverse range of body armor, power armor, drones, vehicles and Gladiatorial Robots. I agree. Chuck attributes this to what he calls “the Kevin Siembieda magic.” And that magic continues in Northern Gun™ Two and Megaverse® in Flames™, as well as other books yet to be announced. Of course, every book is a team effort and the “magic” they contain comes from all of the writers and artists who help to create it. I’m honored and blessed to have a cadre of wonderful staff and freelance creative minds and hands to help me weave Palladium magic. I hope to have more to report in the next Weekly Update. As of right now, not much has changed from last week. We are deep into the engineering stage and dealing with a number of matters that inhibit us from locking down a likely release date. We don’t want to keep shifting dates. The next time we report something, we want it to be solid, so it will probably be a few weeks. You’ll know when we know. Keep the faith. 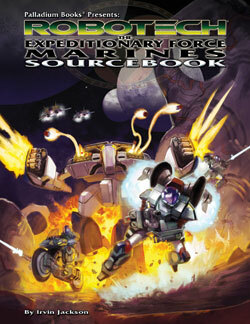 Robotech® RPG Tactics™ is absolutely coming out in 2014, Kickstarter supporters will get product before retail, and this game is going to be epic fun. Palladium is pulling out all the stops for the 2014 Gen Con Indy. We’ll have a larger exhibitor booth, special display, tons of product, many Palladium creators to sign books, and lots and lots of gaming events. Many Palladium Books RPG events. Thank to the efforts of Palladium’s Megaversal Ambassadors and nudges from G.M. Bill Korsak, Palladium will have the MOST gaming events it has ever offered at Gen Con. This will get us a dedicated gaming location and tremendous exposure for our RPG products. We’re looking to showcase everything: Rifts®, Robotech®, Splicers®, Palladium Fantasy®, Heroes Unlimited™, Nightbane®, Dead Reign™, Beyond the Supernatural™, The Mechanoids®, Ninjas and Superspies™, After the Bomb® and all the rest. 45+ RPG gaming events in a dedicated area. The MOST ever for Palladium at a Gen Con. A wide-range of Palladium RPGs, sourcebooks and other product. 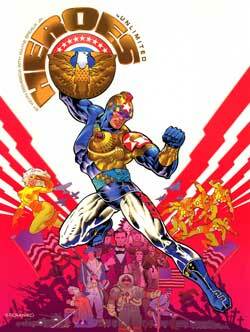 Palladium creators already committed to appear: Kevin Siembieda, Wayne Smith, Jeff Burke, Chuck Walton (artist), Nick Bradshaw (artist), Mike Leonard (artist), Matthew Clements (writer), Brandon Aten (writer), Carl Gleba (writer; tentative), Mark Oberle (writer; tentative), and others are likely to be added; subject to changes and addition. Just a reminder that these books are back in print. Alex will be adding some new collectibles and out of print titles over the next week or two, including a couple of rare copies of The Rifter® #4 we recently uncovered. We’ll keep adding items as supplies allow and as I scrounge items up. 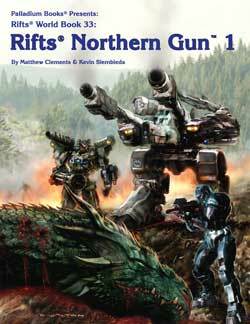 As usual, there are out of print titles, redlined proofreader photocopies signed by me and the staff, signed manuscripts with editors’ corrections, some original art, hardcover books (including Rifts® Northern Gun™ One) and other items you’ll enjoy. There are also hundreds of toys and action figures, all from my personal collection. All items in the store are from my own personal archives and collection. Take a look every few days as new items are added. There may be some items that are perfect for upcoming birthdays and anniversaries. 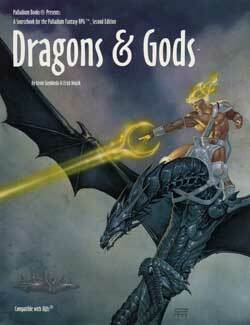 A FREE Sneak Preview of Dragons and Gods™ is now available on DriveThruRPG.com. 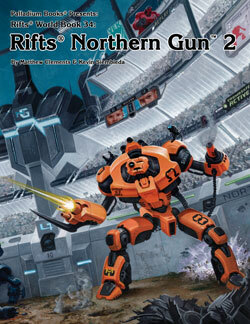 There are also previews available for Rifts® Northern Gun™ One, Rifts® Vampires Sourcebook, Rifts® Vampire Kingdoms™ (Revised Edition), Rifts® Black Market, Rifts® Lemuria, Dead Reign™ RPG, Endless Dead™ sourcebook and others. Plus we plan to add other sneak previews. The original Rifts® Vampire Kingdoms World Book is also available as a PDF on DriveThruRPG, for those of you who may be interested. More is coming. The 2013 Christmas Surprise Package offer is at an end. Now it’s time for Palladium to focus on new products and making 2014 amazing. And that’s the plan. I know people enjoy reading the comments from the Surprise Packages and those who make comments get a kick out of seeing them posted, so here is one last round of them. Enjoy and thank you, one and all. Happy New Year. R.M. in Portage, Michigan, writes (in part): Guys this has been a great year with the Kickstarter and all the other things that are going on. I am sure that 2014 will be an even better one. You should know that your fans are all praying for the best success Palladium has ever had. N.G.J. in Jarratt, Virginia, writes: You are superb! M.D. in Eagle Mountain, Utah, Writes (in part): It’s not Christmas for me without ordering at least one Surprise Package. I was worried I’d miss out this year, so I am glad you extended this offer. P.W. in Kirkland, Washington, writes (in part): I love to combine the multiple game systems and settings you have created into one campaign. For instance I have greatly enhanced many Rifts® organizations by creating spy agencies and agents within them using Heroes Unlimited and Ninjas and Superspies. Do you have plans to expand the Ninjas & Superspies line? R.C. in Fallbrook, California, writes (in part): Going on 20 years of playing, with 17 being in the Marine Corps. Your books and gaming have kept me occupied and sane after more deployments than I care to mention. When I get out I will try to start submitting some of the content my fellow gamers and I have created. Thanks for the amazing games and keep up the good work. J.M.H. in Englewood, Colorado, writes (in part): I’m really excited about your newer products like NG-1 and the Robotech® RPG Tactics. Keep up the good work, guys! C.A. in Fargo, North Dakota, writes: LOVE Palladium! 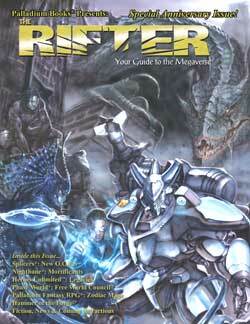 Loyal fan and reader since I found the [original] Robotech® RPG and then Rifts® in the early 1990s. Keep up the good work and great books. K.S. in Cadet, Missouri, writes (in part): I want to say thank you for all the years of enjoyment you guys have provided for me and all other fans of your games. I have been playing Palladium’s games for over 15 years now, since I was 12. So keep up the good work. R.B. in Dedham, Massachusetts, writes (in part): I have been playing Palladium RPGs since 1989. I have a large collection. Thank you for once again providing the Christmas Surprise Package. I truly look forward to it every year. D.B. in Waterford, Michigan, writes: I love the worlds that you have given me over the years. My original books are dog-eared and yellowed with use, and I still flip through them on a regular basis, 20 years later. At the time I spent a month’s allowance on them and my brother laughed at me. I think that 20 years of constant use was worth every penny. S.F. in Louisa, Kentucky, writes (in part): This Surprise Package is a present for my husband. I have ordered him one of these every year that they have been available. Thanks so much for a terrific holiday gift for him! This is the one must purchase of the year. C.S. in Copperas Cove, Texas, writes: I have collected for years. Thanks for this game system and not trying to revamp it just for economics sake. I will be a loyal follower for years to come. A.K. in Richmond, California, writes: Keep rocking. Best and most solid game system ever made. M.M. 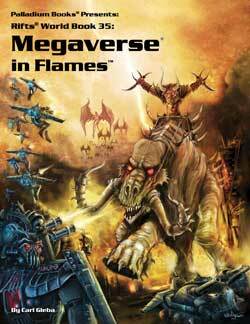 in Seattle, Washington, writes (in part): I am slowly trying to get well-rounded in the Megaverse and Rifts Earth. I have enjoyed all the content in the various books I own. J.M. in Newton, Massachusetts, writes: Just got back into playing Rifts® recently, and saw a bunch of books I haven’t acquired yet. Love to add them to my collection. J.J. in Wayne, Michigan, writes: My friends and I have been enjoying your games for decades. I hope you can revisit doing books for Palladium Fantasy® soon. 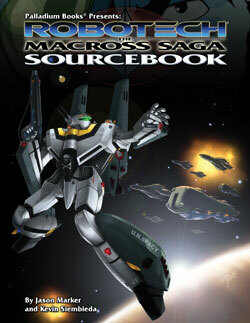 And I think Robotech® RPG is fantastic. Please keep up the good work and happy holidays to everyone at Palladium Books. D.W. in Rush, New York, writes: You guys have been keeping me in gaming for many years, and hopefully for many more to come. Looking forward to all your products and god bless, have a great holiday season.